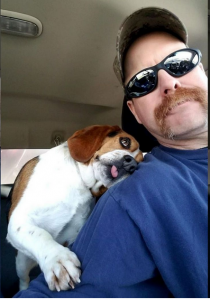 Gregory the beagle has become a local celebrity after a photo of the hound on his “freedom ride” went viral, his rescuer says. Gregory was recently taken to the Franklin County Shelter and Adoption Center after he found running astray. While the hound was in relativity good health, his heartworm test came back positive and was subsequently placed on the shelter’s euthanasia list. “I saw the shelter’s post and my husband immediately drove there to pick him up,” Schenley Hutson Kirk, co-founder of Hound Rescue and Sanctuary, told Fox News on Friday. On the two-hour drive back to Findley, Gregory couldn’t contain his excitement. While new rescues are typically transported in a crate during the drive back to the sanctuary, she said, Kirk’s husband, Joe, let the pup ride safely tethered to the backseat. “He [Gregory] was so overwhelmed and excited, he was licking Joe and being so affectionate,” Kirk said. At a stop light, Joe decided to snap a picture of the pup on his “freedom ride.” At that same moment, Gregory snuggled up to Joe, tenderly looking up to his rescuer.